Check charge level & turn on Chimpy: Push the black button on the upper left side. Four flashing lights should appear if fully charged. Now the Chimpy is ready to use. Check charger cable & plug it in: If you have the correct cable for your smartphone, plug it into the charging port. Charge on the go: While your phone is charging, you are still able to use it. 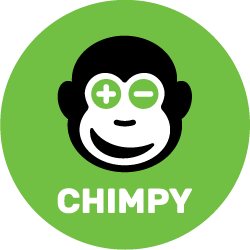 Unplug Chimpy & return: When your phone is fully charged you can unplug it and return it when convenient for you.